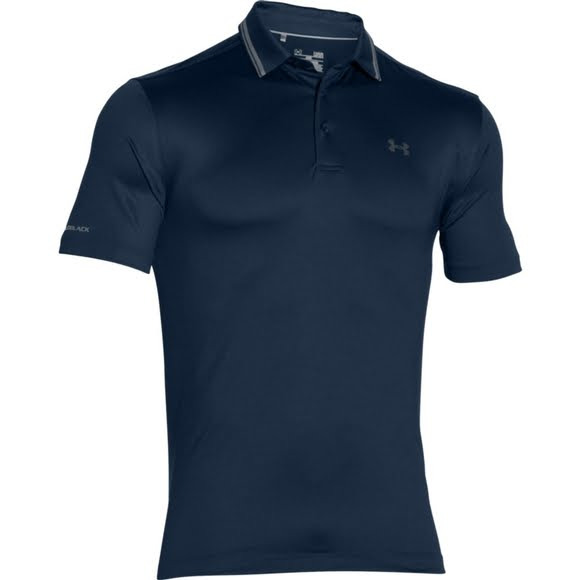 With a loose, fuller cut for complete comfort, the Under Armour Men's Coldblack® Address Golf Polo Shirt features revolutionary Coldblack® technology, and 30+ UPF protection. Stretchy, light, and breathable fabric allows a full range of motion when you tee off. With a loose, fuller cut for complete comfort, the Under Armour Men&apos;s Coldblack® Address Golf Polo Shirt features revolutionary Coldblack® technology, and 30+ UPF protection. Stretchy, light, and breathable fabric allows a full range of motion when you tee off. Revolutionary coldblack® technology reflects infrared heat rays, so even darks color don&apos;t get as hot. UPF 30+ protects your skin from the sun&apos;s harmful rays.